Zhengzhou Xinzheng International Airport (IATA: CGO, ICAO: ZHCC) is the principal airport serving Zhengzhou, the capital of Henan province, China. The airport is located in Xinzheng, 37 kilometres (23 mi) southeast of downtown Zhengzhou. It was opened on 28 August 1997, replacing its predecessor, the now-demolished Dongjiao Airport. The airport is the only international airport in Henan and serves as a main gateway for the province and the central plain area. The airport is operated by Henan Airport Group and is a hub for Cargolux, as well as a focus city for China Southern Airlines, Shenzhen Airlines, West Air, Lucky Air, and Donghai Airlines. According to statistics of 2018, it is the 12th-busiest airport by passenger traffic in the People's Republic of China with 27,334,730 passengers, and the 7th busiest airport in terms of cargo traffic nationwide. As of 2018, the airport is the busiest airport in central China in both passenger and cargo traffic. 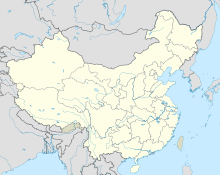 Its IATA code "CGO" is derived from Zhengzhou's former romanization Chengchow. The principal airport of Zhengzhou had been Dongjiao Airport (Chinese: 郑州东郊机场), which was located to the east of downtown Zhengzhou, since 1956. To meet the demand of city development, a plan to build a new airport in Xuedian Township, Xinzheng to replace the old Dongjiao Airport was approved in 1992. The new airport was originally named Zhengzhou Xuedian Airport (Chinese: 郑州薛店机场) after the township of its location and was later changed to the current name. Construction began in 1993 and the new airport was opened on 28 August 1997 with a terminal of 45,900 square meters and a runway (Runway 12R/30L) of 3,400 m. The designed capacity of the terminal was 3.8 million passengers a year. All the flights of Dongjiao Airport were transferred to the new airport. Dongjiao Airport was later demolished to build the Zhengdong New Area CBD on its site. In 2000, the airport was approved by the state council to become the 21st international airport in China. From 2005 to 2007, the original terminal underwent a major expansion and renovation. The new terminal (current Terminal 1) has an area of 128,000 square meters and was opened on 29 December 2007. In 2013, the state council approved the expansion project of the airport, including a new terminal (Terminal 2), the second runway (Runway 12L/30R) and a ground traffic center (GTC), in alignment with its first airport-based economy zone (Zhengzhou Airport Economy Zone). The construction started in 2012, and was finished in 2015. Terminal 2 was opened on 19 December 2015 together with the GTC, and the second runway was opened on 7 January 2016, making the airport the first with two terminals and two runways in central China. After Foxconn Zhengzhou (the main production base for iPhone, located just to the north of the airport) was put into operation in 2010, the cargo transport of the airport has been booming. Between 2010 and 2017, the cargo volume handled by the airport increased from 85,798.1 to 502,714.8 metric tonnes, growing by 34 percent yearly on average, making it the 7th busiest airport in China by cargo traffic. In late 2015 Emirates announced it would begin service from Dubai to Zhengzhou via Yinchuan from May 2016, as part of the airline's expansion plans in China. This is Zhengzhou's first connection to the Middle East. The service started from 3 May 2016. On 11 November 2016, Sichuan Airlines launched non-stop flights to Vancouver. It is the first regular non-stop intercontinental service for the airport. On 12 January 2017, Zhengzhou Metro Chengjiao line started service and began to serve the airport. On 6 December 2017, non-stop flight service to Melbourne was opened by Jetstar. This is the first air route to Australia from the airport. In 2017, the airport surpassed Wuhan Tianhe International Airport and Changsha Huanghua International Airport in terms of passenger traffic, making it the busiest airport in central China in both passenger and cargo traffic. The current Terminal 1 was opened on 29 December 2007, after the expansion and renovation of the former terminal, which was opened in 1998. It covers an area of 128,000 square metres (1,380,000 sq ft) and has 14 gates with jet bridges. The roof of Terminal 1 is shaped like waves. After the opening of Terminal 2, it was closed as a future reserve and temporarily transformed into an exhibition hall. Terminal 2, the only terminal building in operation at present, is located to the northeast of Terminal 1. It was opened on 19 December 2015 with an area of 485,000 square metres (5,220,000 sq ft). Terminal 2 has an X-shaped layout with four piers seeing from above, which resembles and implies "opened arms to embrace the world". The northwest pier is for international flights and others are for domestic use. The ground traffic center was opened together with Terminal 2. It is to the west of Terminal 2 and is connected to the arrival hall of Terminal 2 by three corridors. The GTC has been designed to become a transportation hub for cities in central plains region. Passengers can take taxis, intercity coaches, intercity trains and Zhengzhou Metro trains here. The new air-traffic control tower was put into use on 7 January 2016, together with the second runway. The control tower is 93.5 m (307 ft) in height and its shape resembles the Jiahu Gudi (bone flute) discovered in Henan. The north runway has a Category II Precision Approach. Normally, the north runway (12L/30R) is used for landing while the south runway (12R/30L) is used for taking-off. Both expressways are connected to the airport via Yingbin Elevated Road. Airport rail link is served by Zhengzhou–Xinzheng Airport intercity railway and Zhengzhou Metro Chengjiao line. The Xinzheng Airport railway station is located in the GTC. The waiting hall and ticket offices are on the B2 floor and platforms are on the B3 floor. Intercity trains to Zhengzhou, Zhengzhou East, Jiaozuo and Songchenglu (Kaifeng) are in operation. Trains of the Chengjiao Line of the Zhengzhou Metro connects the airport to downtown Zhengzhou using through services via Line 2. There are several airport shuttle bus routes to various destinations in Zhengzhou. The bus station is on the 1st floor of Terminal 2. The airport also offers inter-city coach services to and from other cities in the central plain region, including Luoyang, Kaifeng, Xuchang, Xinxiang, Nanyang, Anyang, Jiaozuo, Pingdingshan, Shangqiu, Zhoukou, Zhumadian, Heze, Changzhi, and Jincheng. Unlike the Zhengzhou routes, inter-city coaches depart from the GTC. There are several bus routes, operated by Zhengzhou Bus Communication Corporation, serving the airport and neighbouring areas in the Zhengzhou Airport Economy Zone. On 4 February 2014, Joy Air Flight 1533, a Xian MA60 carrying 7 crew members and 37 passengers from Taiyuan Wusu International Airport to Zhengzhou Xinzheng International Airport had a mechanical failure on the landing gear while landing at Zhengzhou. The nose gear collapsed and the aircraft's nose cone hit the runway. No passengers or crew suffered any injuries. On 5 February 2014, heavy snowfall forced the airport to close for several hours in the afternoon and evening, leaving roughly 2,000 passengers stranded in the airport on one of the busiest travel days of the annual New Year. Many grew frustrated by the lack of information provided by airport or airline staff, and began damaging check-in desks and flight information displays, with some assaulting staff as well. The riot and further snow forced the airport to close again on the next day. Police eventually came to the scene and restored order (See Zhengzhou Airport riot). On 15 April 2018, Air China Flight 1350, an Airbus A321 from Changsha Huanghua International Airport to Beijing Capital International Airport was diverted to make an emergency landing at Zhengzhou Xinzheng International Airport. It was reported that a flight attendant was held hostage by a male passenger with a pen. No one suffered any injuries in this incident. ^ a b c "2018年民航机场生产统计公报" (in Chinese). Civil Aviation Administration of China. 5 March 2018. Retrieved 13 March 2019. ^ a b "城市航空货邮量比拼：郑州领跑中部全国排名第七" (in Chinese). 19 September 2017. Retrieved 15 June 2018. ^ "【货邮突破50万吨】郑州机场首成我国中部机场"双冠王"". www.sohu.com (in Chinese). Retrieved 3 April 2018. ^ "国务院、中央军委关于同意新建郑州薛店民用机场的批复" (in Chinese). Retrieved 28 April 2018. ^ "【老照片老故事】郑州东郊机场40年的飞行记忆" (in Chinese). 5 April 2015. Retrieved 16 April 2018. ^ "郑州新郑国际机场改扩建工程竣工并投入运营" (in Chinese). 4 January 2008. Retrieved 16 April 2018. ^ 马玉佳. "The State Council Approved the Planning and Development of Zhengzhou Comprehensive Experimental Zone for Airport-based Economy". china.org.cn. ^ "郑州机场第二跑道启用" (in Chinese). 河南省人民政府门户网站. 7 January 2016. Retrieved 16 April 2018. ^ "2010年全国机场生产统计公报" (in Chinese). Civil Aviation Administration of China. 15 March 2011. Retrieved 15 June 2018. ^ "Emirates Expands Network in Mainland China" (Press release). Dubai: Emirates Airline. 14 December 2015. Retrieved 14 December 2015. ^ "UAE's Emirates Airline debuts flights to China's Yinchuan, Zhengzhou"
^ a b "郑州首条洲际直飞航线 郑州至温哥华今日首航" (in Chinese). 12 November 2016. Retrieved 16 April 2018. ^ a b "Sichuan Airlines to launch direct Zhengzhou-Vancouver service". 12 October 2016. Retrieved 16 April 2018. ^ "郑州地铁1号线二期和城郊铁路一期将开通试运营". www.zhengzhou.gov.cn (in Chinese). Retrieved 13 April 2018. ^ a b "Jetstar opens air route between Zhengzhou, Melbourne". 6 December 2017. Retrieved 16 April 2018. ^ "2017中国各大机场旅客吞吐量排名 郑州新郑机场登顶中部六省第一" (in Chinese). 24 May 2018. Retrieved 14 June 2018. ^ "20周岁到来之际 新郑机场T1航站楼"蝶变"做展馆" (in Chinese). Retrieved 26 April 2018. ^ "新郑机场T2明年竣工 X形寓意张开双臂拥抱世界" (in Chinese). 10 October 2014. Retrieved 25 August 2018. ^ "民航河南新塔台正式启用 郑州机场飞进"双跑道"时代(组图)" (in Chinese). Retrieved 3 May 2018. ^ "郑州机场完成Ⅱ类标准建设" (in Chinese). 郑州市人民政府. Retrieved 3 May 2018. ^ "桂林航空开通郑州=恩施航线" (in Chinese). 23 May 2018. Retrieved 23 July 2018. ^ a b c "2019年南航河南公司夏秋航季新增多条航线" (in Chinese). 13 March 2019. Retrieved 15 March 2019. ^ a b "郑州到上海机票低至350元 南航本月底将新开郑州-湛江航线" (in Chinese). 24 October 2018. Retrieved 28 October 2018. ^ "2018年冬航季换季首日包头机场迎来多条航线首航" (in Chinese). 28 October 2018. Retrieved 28 October 2018. ^ "Jetstar Pacific schedules new China charters in 3Q18". routesonline. Retrieved 3 July 2018. ^ "西安至郑州直飞航班8年后复航 部分旅客称高铁仍为首选" (in Chinese). 25 October 2018. Retrieved 28 October 2018. ^ "Lanmei Airlines 1Q19 China service expansion". Routesonline. Retrieved 13 March 2019. ^ "Lucky Air plans Zhengzhou – Bangkok route from Oct 2018". routesonline. Retrieved 9 August 2018. ^ "祥鹏航空新开郑州—盐城航线" (in Chinese). 10 September 2018. Retrieved 28 October 2018. ^ "Malindo Air schedules new China routes from May 2019". Routesonline. Retrieved 11 March 2019. ^ a b "机队规模扩充 金鹏航空迎来2018年冬春航季" (in Chinese). 28 October 2018. Retrieved 28 October 2018. ^ "Thai Lion Air adds new scheduled charter service to China from late-Sep 2017". routesonline. Retrieved 2 October 2017. ^ "New Destination: Phuket to Zhengzhou". www.lionairthai.com. ^ a b "天津航空新航季新增国内外50余条航线" (in Chinese). 23 October 2018. Retrieved 28 October 2018. ^ "乌鲁木齐航空将开通大连至郑州、博鳌等航线" (in Chinese). 24 October 2018. Retrieved 28 October 2018. ^ "乌鲁木齐航空从克拉玛依出发，飞向温暖博鳌" (in Chinese). 24 October 2018. Retrieved 28 October 2018. ^ "Vietnam Airlines adds new China scheduled charters in 1Q18". routesonline. Retrieved 28 April 2018. ^ a b "西部航空新开多条郑州出港航线" (in Chinese). 14 March 2018. Retrieved 15 March 2019. ^ a b "冬春航班换季 西部航空新开多条热点航线" (in Chinese). 10 October 2018. Retrieved 28 October 2018. ^ "Seasonal new flights bring you to more wonderful destinations". www.westair.cn. ^ "圆通航空"郑州-东京"定期全货航线首航" (in Chinese). 中国民航网. 11 September 2018. Retrieved 11 September 2018. ^ "机场大巴_空港大巴_空港交通_河南机场" (in Chinese). Retrieved 24 April 2018. ^ "往返航空港区和郑州机场T2航站楼的夜班公交正式开通" (in Chinese). 27 June 2018. Retrieved 8 July 2018. ^ "Joy Air's Xian MA60 B-3455 suffers a landing accident at Zhengzhou". 6 February 2014. Retrieved 14 June 2018. ^ "郑州机场否认被打砸：一旅客把矿泉水扔到公示板" [Zhengzhou Airport denies destruction; claims passenger threw bottle at display board]. People's Daily (in Chinese). 9 February 2014. Retrieved 29 January 2018. ^ "Hijacked Air China flight makes emergency landing". 15 April 2018. Retrieved 14 June 2018. Wikimedia Commons has media related to Zhengzhou Xinzheng International Airport. Airport information for ZHCC at World Aero Data. Data current as of October 2006.